I get asked an awful lot of questions about teaching English in South Korea and on this page, I have tried to compile my answers into a coherent list so that it helps people to get the job they want in South Korea. All of the advice from my How to Teach English Abroad is still applicable to South Korea and I highly recommend reading that post before you go into the specifics of applying for a job in South Korea. If any of my answers are incorrect, please contact me and I will amend this page accordingly. If there is anything missing, please feel free to ask new questions in the comments section and I will respond to them so that others can have the benefit of seeing the answers. At the end of this page, you will find a list of other pages that I have written about teaching English in South Korea that may be useful to you. I hope that you find this information useful. What Is Your Background Of Living And Teaching in South Korea? I spent a year teaching at a hagwon in Daegu and all of my advice is based upon my experiences. I got the job by applying directly to the school though an advertisement that I saw online. A couple of years later I came back to live in Seogwipo for six months, on the beautiful island of Jeju, where my girlfriend was teaching English. I was not teaching there full time, but I did do a few weeks teaching to cover teachers who were away. What Is It Like To Teach English In South Korea? I had great experiences teaching in South Korea. I had the most money I have ever had, a comfortable life, and my job was often fun. Here is a video showing some of my weekends and one off classes whilst teaching English in Daegu. I didn’t have a camera until the end of my year, and I used it rarely, but this is a mish-mash of random video clips that was made for my friends as a memory of our experiences. What Are The Minimum Requirements To Teach English in South Korea? Citizenship (have a passport) from a native English speaking country. At this time, South Korea only considers the U.S., U.K., Ireland, Canada, Australia, New Zealand, or South Africa to be native English speaking. Hold a bachelor’s degree (or equivalent / higher) from an accredited college or university. Be able to obtain a clean, national level criminal record check. Pass a health and drug test upon arrival in Korea. If you do not meet all of these criteria, unfortunately you cannot teach in South Korea at this time. There are many other countries where you might be able to teach English however, so please take a look at my ever growing page of English teacher jobs. Do I Need a CELTA / TEFL / TESOL / Teaching Certificate to Teach English in South Korea? If you want to work for a government school, yes, you need the minimum of a 120 hour TEFL / TESOL certificate. I know teachers who did not have their government jobs renewed when the rules were changed because they didn’t have any teaching qualifications. If you wish to work for a private school, you do not need any form of teaching qualification. However, obtaining a TEFL or some other form of teaching qualification will definitely increase your chances of landing a good job and might result in a higher salary. 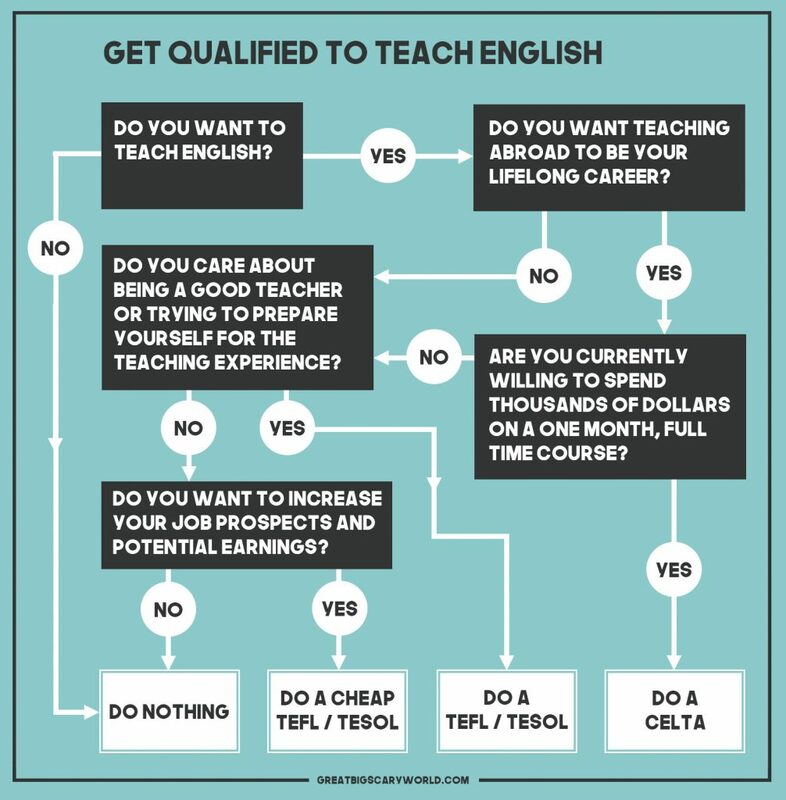 Take a look at the ‘Get Qualified to Teach English’ infographic to see which teaching qualification, if any, would be best suited to your needs. When I taught English in Daegu, I didn’t have a teaching qualification, however the market was less competitive at that time and I had experience teaching in England and Uganda (which my boss later told me secured my interview). How Can I Get a Job Teaching English in South Korea? If you meet the aforementioned requirements, apply directly through my site for a job in South Korea using my agency contact. Read through my post, How To Get A Job Teaching English In Korea, and follow the different suggestions there. Where Else Online Can I Find a Job Teaching English in South Korea? Apply through agencies by Googling ‘Teach English in Korea (Agency)’ and various combinations thereof. Apply directly through TEFL / ESL sites (such as TEFL.com and Dave’s ESL Cafe). Is it Better to Apply for a Job Directly or Use an Agency? Is ketchup or mayonnaise better? Both have their benefits. If you apply for a job directly, you may be able to negotiate working conditions with the employer, while if you apply through an agency, they do most of the hard work for you, but are less flexible. Try both, see which works out. I did both and then compared the different job offers I received. How Much Should I Hope to Get Paid Teaching English in South Korea? As a first time teacher, try to aim for 2.1 million won a month (or more). In 2011, I got 2.2 million a month with some teaching experience and no teaching qualifications. If you get an English teaching qualification such as a TEFL, you should be able to aim for a higher salary – maybe 2.3 million a month. Is There an Agency That You Would Recommend? I am currently working with this agency to help place potential teachers in Korean schools and thus far the feedback has been positive. You can apply directly through my site and my recruiter contact will get back to you to help you out, or feel free to look elsewhere on the web. I don’t have great familiarity with any other recruiters so don’t recommend anyone else at this time. Do I need to speak Korea to teach English in Korea? How Do I Avoid Being Scammed by a School / Know That it is Reputable? Search through forums online and see what other people say about it. Also ask if you can have the email addresses of previous teachers so that you can email them and ask about the school. If you can’t find any information online, it may be a dodgy deal. If it’s a chain, it will have a reputation to keep up and is likely to be reputable. South Korea is one of the safest countries I have ever been to (I don’t keep a list, but I move about a lot). Although I had two bikes stolen, I never felt threatened and as far as I am aware, South Korea has a very low rate of violent crime. How Much Money Can You Save in South Korea as an English Teacher? This depends completely on your lifestyle and whether or not you teach extra, private (illegal) classes. See my .pdf detailing pay for English teachers across the world and how much they can save. In summary, Korea is one of the best places to go to save money (THE best in my opinion if you don’t have teaching certificates and years of experience). Here’s a rough estimate: You get paid 2.2M a month, plus a bonus of 2.2M upon completion of contract and your tax is super low (assuming you cancel your medical insurance and pension payments which you can read more about here – note: get travel insurance to cover your medical expenses and you will save money / be safe). Your apartment is free, as are your flights. That means you will earn around 27.6 M won in a year (over £18,500 as of January 2017). You will save as much as you don’t spend on eating, drinking, and going places. How much beer and soju are you going to drink? Will I get a Free Apartment? Yes, you should. I wouldn’t take a job that doesn’t offer either a free apartment or a housing allowance (you may have to pay a large deposit if you sort the apartment out yourself). Will the School Pay for My Airfare? Normally, yes, although some companies now only offer one way flights as the industry is booming and there are lots of teachers available. You may have to pay for your flight in advance and they will refund you as you reach the 6 and 12 month marks. This stops people turning up for a week, deciding that they don’t like Korea, and then disappearing again. Where is the Best Place to Live in South Korea? Do you want chocolate or cheese with that? Are There Many Other Foreign Teachers In South Korea? Hundreds. Maybe thousands. In most towns they are very easy to find (easier outside of Seoul which is MASSIVE). I’m a Non-Native Speaker: Can I Get a Job Teaching English in South Korea? Not legally at this time. The problem lies with the visa issuing office. Contact agencies and see what they say incase things change. This is a silly pre-requisite and I hope that it changes soon, but there are many other places in the world where you can teach English. Can I Get a Job Teaching English in South Korea Without a Degree? Not legally. However, I know of one person who turned up at the age of nineteen, without a degree, and found work for a couple of months. This was not legal. Do research about your company online. If you do this properly, you can find a safe company. Most people keep their jobs for the duration of their contracts although I had a few friends who were screwed over by their schools. As with everything in life, nothing is definite, and even big school go under sometimes. Just do your best and be prepared to adapt. As I’m Only Signing a 12-Month Contract, Will I lose My Job in One Year? If business is going well, they will (hopefully) offer you a new contract. However, a lot of people choose to change schools every year for better working conditions or for variety. Being offered a twelve month teaching contract in Korea isn’t really a concern, it’s just normal practice. Should I Get a Job in Advance or Just Turn Up in Korea and Find One? If you have the money, just turning up (while applying online) might offer you the best pay opportunities and working conditions as you will be in the country and can meet schools in person, so they will take you seriously… however it may take time to do and you may end up running out of money if you don’t have a good grounding. You will also have to leave the country in order to be granted the E2 visa and you will have already paid for your flights to Korea, thus it will probably end up being much more expensive in the long run and I definitely think that applying in advance is the safer way to do it. If I had the cash and wanted to go back again, there is a possibility that I could turn up and use my friend network to find out about new potential jobs, but I would still prefer to have a job sorted in advance. Teacher community pages in SK on FB have some awesome people who might be willing to help you out. When Is the Best Time to Apply for Teaching Jobs in South Korea? If you want a government job (lower pay, but stable job), you have to apply through EPIK or GEPIK at the right time of the year. If you go for a hagwon (my preference), you can apply anytime as they take teachers on year round, depending on when the previous teachers leave. Do Potential Employers Prioritise Younger Applicants Over Experience? As far as I am aware, no, but most of the people teaching in Korea range from early twenties to forties. The demographic may simply be due to the lifestyle choice of moving half-way across the world to teach English suiting younger, ‘more adventurous’ people. Or maybe I felt like there was a younger demographic because I was younger and I spent time with other young people. How Long Does it Take to Get a Job Teaching in South Korea? It depends how lucky and picky you are. You could have a job within days if you’re flexible and meet all the requirements. Don’t forget that you will have to collect all of your documents and the criminal background check can take some time to process (particularly if you are American) so I would try to this in advance. How Long does it Take to Get a Korean Visa? When I had all the documentation (criminal checks, notorised degree, invitation from the school, etc), it took less than a week. These times may vary, so check with the Korean embassy in your part of the world. I’m Vegetarian / Vegan: Will it be Difficult to Live in South Korea? Yes. However, I am also a vegetarian and lived in Korea for a year without giving it up. Check out this really useful page about how to be vegetarian / vegan in South Korea. Is There Anything That You Would Recommend Doing in South Korea? Yes. Here are some things you should try in South Korea. If you go to Daegu, here are my favourite five things to do for free. If you go to Jeju, cycle, climb, walk, swim, do everything outside! I could go on, but in short, Korea is a pretty cool country filled with pretty cool stuff to do. What Are the Benefits of Teaching English in South Korea? They are so numerous that I wrote a whole separate article about them. Here is my selection of ten benefits of teaching English in South Korea. Would You Go Back to Teach There Again? No because my life has changed and I am pursing a different path. However, I loved my time in South Korea and I am grateful for the experiences. I wrote an article after I left Korea that was titled Why I Will Never Go Back to Teach English in South Korea (which I later changed to Why I Stopped Teaching in South Korea)… and then I went back to live in South Korea after all! On the second occasion I wasn’t an English teacher, but my main reasoning for not teaching English now is that, ‘I don’t want a regular, stable job’. I am pursuing interests concerned with self-employment and not having a boss / schedule. Will it work out? I don’t know, but I can always go back and teach if it doesn’t! Will I Get Taxed by Korea or My Home Country? I cancelled my pension plan and health insurance (as I couldn’t cancel the pension only) which saved me over 1.7 million won and then purchased travel insurance for the year instead which cost about 0.7 million won. This meant that I was medically covered for the year and I saved myself a million won. If you want to do the same, I advise you read this page about travel insurance and this page about why I did it. Can I Choose Which Currency I Get Paid In? You are paid in South Korea won, direct to your Korean bank account (which your school will help you set up when you arrive). To transfer it out of the country, you simply go to the bank and pay the transfer fee. With the bank I chose, I got charged about 30,000 Won each time I made a transfer and the money would take a few days to reach the UK. Can you get me a job teaching English in South Korea? Kind of – apply here. If you get a job, you’re welcome. Should I go to South Korea to teach? Can You Get Me A Job Teaching Anywhere Else? Possibly – Take a look at this page, Apply For a Job As An English Teacher.